El Molí de la Plana and La Rovirota form a neighbourhood of four houses at the end of the valley in Riudaura, a little village next to the Vall d’en Bas, only 10 kms away from the capital of the shire, Olot, and the famous Natural Park of the Volcanoes and its hiking paths. This neighbourhood is found just where the concreted country road finishes, away from traffic and noises. It is surrounded by woods, two streams and by dense forest vegetation which changes its colour all along the year (elders, poplars, holm oaks, oaks…) This place seems isolated from the word. Here silence is large, your senses relax and you can breath the forest and the streams. In the middle of the neighbourhood there are the common spaces: gardens, playground area, barbecues, playing room, green house with interior swimming pool and in the summer garden with sun loungers. All around there are the houses: the Rovirota, the Old Mill with its pond, The Eco-house, the Barn and the little Hut. Our dwellings are well equipped with the appropriate comfort of rural houses with two spikes. For years we have been working to provide families that love nature and calmness and that wish to enjoy their holidays in a special environment with self-catering houses and with entertainment for children outdoors. Next to the Eco-house there’s a big green house with a covered and heated swimming pool great for children. It is open to everybody during the day and in operation most part of the year. Water temperature is 28 grades Celsius. Swimming pool sizes are 3X10 (depth 0,5X1’5m)..
Next to the Barn, right in front of the play area there is a common room with toys and a tennis table open to everyone. 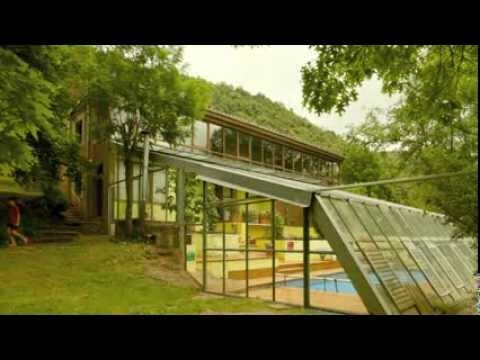 We strongly recommend this destination to families with children and couples that wish to spend some days in a truly rural environment not far from Olot and the most visited sightseeing points in la Garrotxa, and also to those who want to have the possibility to visit la costa Brava, the Pyrenees, Figueres and Girona.